Regular visitors to Rickwood in Portpatrick may be interested in a couple of new developments at what is probably our most popular local visitor attraction – The Mull of Galloway, Scotland`s most Southerly Point. 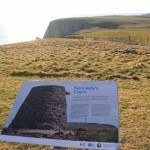 Several information boards have been installed at various vantage points providing interesting facts about the nature and history of the Mull of Galloway. 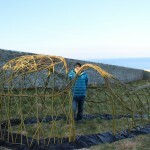 The other point of interest is that as part of the gradual improvement programme to the walled garden beside the lighthouse cottages, living willow sculpture has been planted. The Mull of Galloway Trust is to be commended for their hard work in making continual but tasteful improvements to this unique area of Scotland.